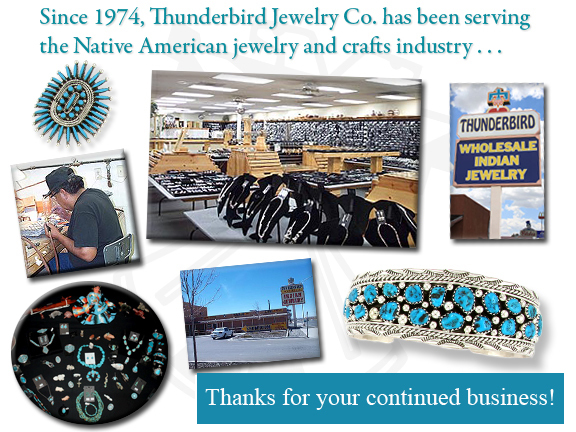 Since 1974, Thunderbird Jewelry Co. has been serving the wholesale Native American ("Indian") jewelry and crafts industry. Thunderbird Jewelry Co. sells product which is crafted by Navajo, Zuni and local Pueblo Native Americans. We also offer carvings and other Native American-crafted goods.We offer outstanding handcrafted products in sterling silver, including bracelets, beadwork, bolo ties and buckles, earrings, ladies' and men's rings, ladies' and men's watches, necklaces, pendants, jewelry sets, and liquid silver, which is sometimes called "heishi" or "hishi." Within the trade, Thunderbird Jewelry Co. has maintained a strong position as an industry leader. Our company was one of the first to offer stock numbers on each item to make it easier for our customers to be able to reorder items. Since the year 2000, Thunderbird Jewelry has offered shopping and product ordering options on the Internet through our website. For over four decades, we have offered competitive pricing and a reliable selection of items for our customers so that they are able to depend on us as their main supplier of Native American jewelry and crafts, and we are grateful for our customers' loyalty to us. For our wholesale customers, especially those who purchase in large quantities, we offer a competitive pricing schedule. We offer one of the most comprehensive selections of turquoise, coral, opal and black onyx jewelry. Thunderbird Jewelry's relationships with the Navajo and Zuni Native American silversmiths allow us to offer quality Native American jewelry which is authentic and carries the prestige of being a part of the "Indian" jewelry tradition which has been passed from generation to generation for many years. Our selection of turquoise jewelry is one of the widest selections of Native American jewelry in the United States. Handcrafted by Navajo and Zuni silversmiths, we sell the following types of turquoise in our jewelry: Blue Ridge, Sleeping Beauty, Turquoise Mountain, Kingman, Royston, Fox Mountain, Natural Nevada, Dry Creek and White Buffalo. As we build and buy jewelry throughout the year, our jewelry is dependent on available supply of turquoise stone, so we cannot always guarantee that we will have a particular stone in our current selection. However, we do make a strong effort to provide as wide of a selection as possible for you. We also sell opal jewelry as well, in various colors and shapes. If you are looking for a particular stone, please contact us and we will do our best to find it for you. So that we can serve you better, we strongly encourage you to contact us to create an account on our website. We want to offer you the best service and the right pricing for your business. You can call us at 1-800-545-7998 and we will determine what would be the right pricing schedule and type of account for you. Once your account is created, our website pricing will reflect the correct pricing for you and your jewelry and crafts purchases. Our goal is for you to be complete satisfied with your purchase. Recently we made the decision to sell to the retail trade, which has been a great opportunity for collectors and those who appreciate Native American, or "Indian", jewelry and crafts. Now anyone is able to purchase from Thunderbird Jewelry Co. For those who purchase in larger quantities, there are special pricing schedules available. Contact us at 1-800-545-7998 for more information on how you can save on your purchases with us. For many years, the assurance of genuine Native American crafts has been a concern to many people. We do our best to maintain accurate and current information on the products we sell, which includes the authenticity and origin of each item. If you have any questions or concerns, please contact us and we will provide as much information on a particular item. Please note that we do provide key information about each item within the product description on our website as well. Thunderbird Jewelry's showroom in Gallup, New Mexico is one of the largest Native American jewelry showrooms in the United States. We invite you to come to Gallup to see us and to browse through our large selection. As we buy from the local silversmiths in the New Mexico/Arizona region, including from Navajo and Zuni craftspeople, we add items to our inventory on a daily basis. With that in mind, you will want to come by our showroom and see what is available. Located on historic Route 66, Thunderbird Jewelry is located on the west end of Gallup at 1923 West Historic Route 66. We are located two hours west of Albuquerque, New Mexico and less than five hours northeast of Phoenix, Arizona. Feel free to contact us if you are coming to visit the Gallup, New Mexico area and would like recommendations on lodging, dining and local activities.